It's the NFL's opening week, aka Another Pro Line Week: Our first week honoring America's most ludicrous set of football cards was a smashing success (hey, we laughed). So, rather than stop while we're ahead, we've decided to bring you seven more days of this nonsense, highlighting what happens when NFL players take off the pads and helmets. It won't be pretty. 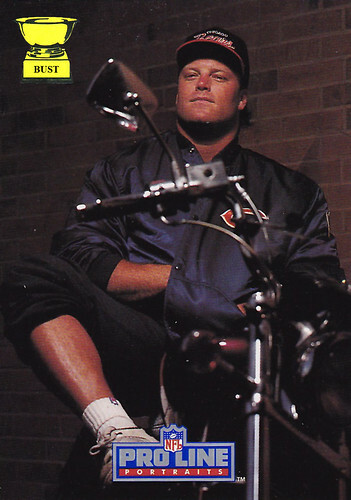 Tom Thayer's train of thought, from 10:22 to 10:24 a.m., June 2, 1991: "Yep, judging from what I can see in this little mirror on my moped, I look pretty badass. ... Let's see. Socks: check. Pantlegs: check. Sleeves: check. What else can I roll up? ... I should be in a Night Ranger video. ... Good thing I remembered to shave and oil my legs this morning. ... I wonder if they'll be able to tell I'm holding a roast beef sandwich inside my jacket. Mmm, this thing's getting nice and warm." Maybe when he got his legs waxed they gave him a girly manicure and he thought better of showing it so he's hiding his hands.